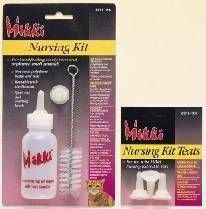 Mikki Nursing Kit Mikki Nursing Kit comprises of a polythene feeding bottle and latex teats for feeding small animals. Includes spare teat and cleaning brush. Mikki Nursing Bottles For hand feeding newborn and orphaned small animals.